What Rockstar is doing with the PC and “next-gen” versions of Grand Theft Auto V is downright admirable. Sure they are taking their sweet time doing it, but I much prefer a long wait to a slap-dash, press escape to instantly quit, port with more problems than new features. First they told us they are giving previous players a reason to come back, and now they confirm a first person mode and 4k resolution support. First person has been a rumored feature for a while, but the modeled vehicle interiors and suite of new animations are icing on the cake I wasn’t expecting. 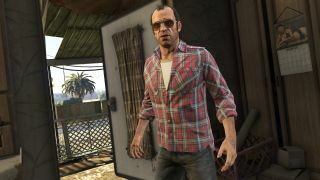 A year after its initial release, Rockstar is still working hard to keep the latest version of GTA V feeling cutting edge, and at this rate the PC will be home to the definitive version. I’m late as hell to the Alien: Isolation party, but this week I’ve been muddling through the game’s colossal 20+ hour storyline in little chunks. I haven’t found it especially scary, to be honest—tense, but not scary. In well-lit environments, I have adjusted to the sight and animation of the alien and no longer consider it an unseen threat. Last night, though, the systems of the game came together in a way that I found genuinely unsettling, as I manoeuvred through a strobe-lit environment and saw the alien drop out of nowhere, behind some fellow human survivors. I went straight for a locker and hid, hearing screams as the alien devoured them and then, a silence, until the locker tore open and the alien killed me, too. By itself, the alien’s aura becomes undone the more you play, but the systems are smart enough to keep finding ways to make that creature scary. Brilliant game. I liked the look of Endless Space more than I really found time to play it, but this week I decided to take a stab at Amplitude’s fantasy follow-up: Endless Legend. Having been rather disappointed by Civilization: Beyond Earth, I’m taken by just how many things Legend gets right. The combat system is an elegant improvement on Civ; empire development is involved and interesting; the UI is crisp and pleasant to use. The factions are varied, play very differently, and are beautifully presented. It’s the art and music that have really sold the game to me, though. Endless Legend’s take on fantasy has a light sci-fi touch and the gentle pastel art reminds me of a Gene Wolfe book cover. This has been something of a trend recently—Destiny shows off many of the same influences. I’ve been running a pen and paper campaign in Monte Cook’s Numenera, lately, so there really couldn’t be a better time to be surrounded by lovely hand-painted space wizards. The EFF recently petitioned to legalize DRM circumvention in "abandoned" games, a move that, if successful, will make life a whole lot easier for retro gamers and preservationists. Older games reliant on matchmaking servers or online DRM checks are pretty much done in when remote servers go offline, and while cracks are always an option, they're often not a realistic choice. The process of legalizing this particular type of DRM circumvention is "burdensome and confusing," but if we're serious about preserving video games, both for posterity and playability, then this is a necessary step and hopefully one that will ultimately prove successful. I love seeing bad things happen to bad people. Or in this case, to bad programs. Games for Windows: Live is undoubtedly a bad program, and I smile every time it comes closer to annihilation. This week, Nordic Games patched it out of Red Faction: Guerilla. This is surprising—despite their previous promise that it would happen. It's surprising because Guerilla was made by Volition for THQ—the former now with Deep Silver, the latter sadly deceased. Nordic acquired the rights to much of THQ's catalogue, but they didn't have anything to do with the game's creation; just its current distribution. To then go back in to remove the unwanted GfWL-wrapper is a step worth celebrating. Especially because Guerilla is such a great game.